SHALL SERVE HIM FOR EVER! When Dom Gerard McGinley founded the Abbey back on May 26, 1951 he dedicated it under the patronage of Christ the King. The abbey’s official name is Our Lady of Christ the King. The more common everyday title is Abbey of Our Lady of the Genesee since it is a long standing tradition of the Order that monasteries take their name after the place in which they are founded. Since we are located in the beautiful Valley of the Genesee with the Genesee River Bordering our property all along the eastern edge Abbey of the Genesee is quite appropriate. 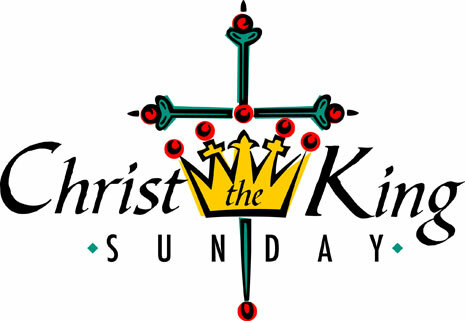 It is clear that Dom Gerard McGinley had a special devotion to Christ the King. 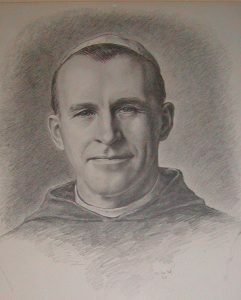 Among his letters to his family shortly after he was appointed Abbot of Genesee and while still at Gethsemani making arrangements he has a number of references to the Kingship of Christ. One example found in the book, A TRAPPIST WRITES HOME, he mentions in a letter to his brother and sister in-law: I cannot tell you, Syl and Madeline, how appreciative I am of this grand overture on your part towards Christ the King and Our Lady of the Genesee. He is responding to their offer to come to Piffard for a few weeks to help him with setting up the foundation and, in their generosity, stayed for the rest of their lives. Madeline was in charge of the ladies guesthouse and Syl helped on the farm and became in charge of the black angus herd. They are buried in our cemetery. Dom Gerard was in good company as St. Benedict himself makes several references to the Kingship of Christ in his rule. The first is to be found in the prologue: This message of mine is for you, then, if you are ready to give up your own will, once and for all, and armed with the strong and noble weapons of obedience to do battle for the true King, Christ the Lord (prologue #3). Today also marks the end of the Jubilee Year of Mercy. This week from Tuesday until Saturday our Br. Placid will be making a private retreat in preparation for entering the novitiate next Sunday, the 1st Sunday of Advent, the beginning of the new liturgical year. A propitious time to enter a new phase of his initial formation. Do keep him in prayer especially these days. As mentioned last week we were in the process of installing a new sound system for the Abbey Church as the previous, recycled system, proved to be inadequate for the renovated Church. Work was completed this past Wednesday and, glad to report, is a definite improvement especially regarding the even distribution of the reader’s voice. The kingdom to which Jesus bears witness by becoming a part of the human condition and by identifying with our suffering and dying, reveals the ultimate truth about the God of the universe, which is that God is completely together with us on every level of our being. God’s presence and care are greater than anything we can imagine and much more substantial than anything we can contrive. This reassurance is available whoever we are, wherever we are, whatever is happening, on only one condition: our consent – the consent of faith in the infinite mercy of God. Interior turmoil and the external vicissitudes of life do not interfere with divine union. The gift of wisdom empowers us to find God in our helplessness, weakness, and sinfulness. This is the source of Jesus’ ecstatic joy at the though of how his Father brings to perfect happiness such hopeless and helpless creatures as we are, who are always at one another’s throats when we should be in one another’s arms.